CCL designed the bridge bearings for the on/off ramps to the specification of BAA. These were supplied to Watson Steel, who carried out the installation. 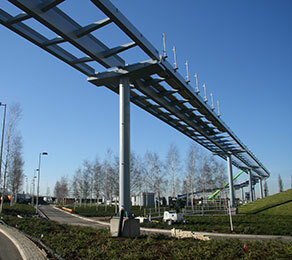 The on/off ramps provide rapid access from the new terminal to the adjacent car parks. They were designed to accommodate cars that run on tracks by ATS. Although the first of its type in the UK, it was hoped that this design could be developed as a means of transport in many urban areas. Bearing design was undertaken by CCL Engineers, using the latest bespoke software to meet client specification, whilst ensuring the most economical configuration. CCL was awarded the project because of its extensive experience in the design and manufacture of bridge bearings and its ability to provide an effective solution, at a competitive price. The design, manufacture and delivery of the bearings were all completed to a tight programme of works, ensuring the client’s schedule was maintained.